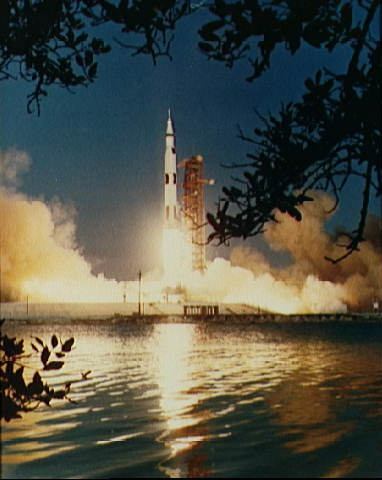 First up: 45 years ago today — January 22, 1968 — a Saturn 1B launched the unmanned Apollo 5 mission from Cape Canaveral. Apollo 5 was the first test flight of the Lunar Module (LM) ascent and descent stages. 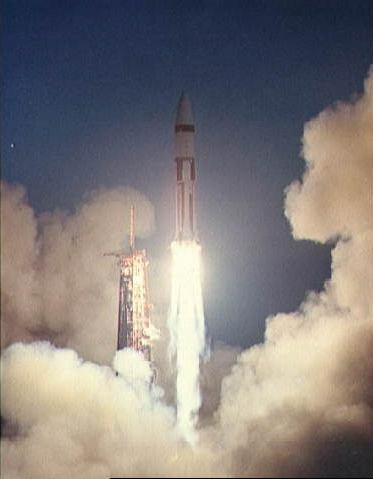 Once the LM was released into Earth orbit, its engines were fired in sequences that simulated a lunar approach and landing, including an abort scenario. Despite one premature shutdown of the descent propulsion system, the overall mission was considered a success. Thirty years later — 15 years ago today — the Space Shuttle Endeavour launched from the Kennedy Space Center on mission STS-89. US astronauts Terrence W. Wilcutt, Joe F. Edwards, Jr., James F. Reilly, Michael P. Anderson, Bonnie J. Dunbar, and Andrew S.W. 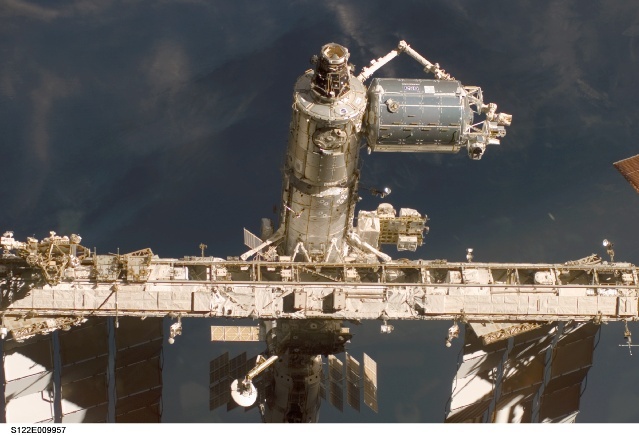 Thomas, along with Russian cosmonaut Salizhan S.Sharipov, docked with the Mir space station where Thomas replaced astronaut David Wolf. Finally, on this date 10 years ago, we received the last signal from the Pioneer 10 spacecraft. On its 30-year mission (far exceeding its 21-month design life), Pioneer 10 visited Jupiter and explored the outer solar system. At the time of its last contact, the spacecraft “was 7.6 billion miles from Earth, or 82 times the nominal distance between the Sun and the Earth,” cruising in the general direction of Aldebaran. Ten years ago today — January 16, 2003 — the Space Shuttle Columbia launched from Kennedy Space Center on a mission that would end sixteen minutes too soon. At the time the shuttle launched, we (by which I mean the public) thought the mission profile was nominal. 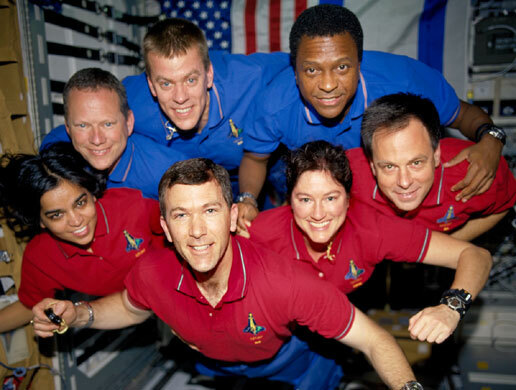 The STS-107 crew — Rick D. Husband, William C. McCool, Michael P. Anderson, Kalpana Chawla, David M. Brown, Laurel B. S. Clark, and Israel’s first astronaut, Ilan Ramon — busied themselves with scientific investigations around the clock during their 15 days in space. KSC landing was planned for Feb. 1 after a 16-day mission, but Columbia and crew were lost during reentry over East Texas at about 9 a.m. EST, 16 minutes prior to the scheduled touchdown at KSC. A seven-month investigation followed, including a four month search across Texas to recover debris. The search was headquartered at Barksdale Air Force Base in Shreveport, La. Nearly 85,000 pieces of orbiter debris were shipped to KSC and housed in the Columbia Debris Hangar near the Shuttle Landing Facility. The KSC debris reconstruction team identified pieces as to location on the orbiter, and determined damaged areas. About 38 percent of the orbiter Columbia was eventually recovered. In perhaps a fitting tribute to the STS-107 crew, some of the science experiments were found during the debris recovery effort. While much of the data the astronauts gathered had been transmitted during flight to colleagues on the ground, the recovered experiments produced additional valuable information. Visit the STS-107 memorial page for more information. Fifteen years ago today — November 19, 1997 — the Space Shuttle Columbia launched from the Kennedy Space Center on the eighth shuttle flight of 1997. STS-87 carried U.S. astronauts Steven W. Lindsey, Kevin R. Kregel, Winston E. Scott, and Kalpana Chawla, Japanese astronaut Takao Doi, and Ukrainian cosmonaut Leonid K. Kadenyuk. The crew spent a little over 15-1/2 days in space, primarily operating the US Microgravity Payload on its fourth mission. The crew also deployed the SPARTAN free-flying observatory, but problems with its attitude control system made it necessary to retrieve and stow it. During the retrieval operation, Doi became the first Japanese astronaut to complete a spacewalk.